Life of a BZscrapper: National Coffee Day Blog Hop 2018! OH Happy Day!! It's National Coffee Day (what a great excuse to have an extra cuppa or two!) and as Coffee Lovers of course we're going to celebrate! All you have to do is sit back, hop, take in all of the inspiration, and leave some love at each stop along the way! And I have some Blog Candy for you today too so be sure to read through to the end so you don't miss anything! The hop starts at the Coffee Loving Cardmakers Blog here! You may have arrived here from my Coffee Lovin' Teamie, Kathy's blog! If you get lost along the way, never fear... just head back to the Coffee Loving Cardmakers Blog where you'll find the complete hop listing and links! (I've added the complete hop listing at the bottom of this post as well). And we have a special guest up on the CLC Blog, Sheri Gilson is representing oh so generous Super Sponsor Gina K Designs! Be sure to visit her blog too and leave some love there! Wow! that is over $400 worth of prizes that are hidden among the designers that are joining us today. Leave a comment on this post as well as comment along the way for a chance to win! Commenting will be open through Saturday, October 6th at 11:55 pm pacific. Winners for the prizes above will be posted on Monday, October 8th. I am so honored to have my post sponsored by CAS-ual Fridays Stamps! We're giving away a $25 gift code to the CAS-ual Fridays Shop here at my blog! I've created a couple projects using some wonderful CAS-ual Fridays products for today! I started by cutting a shaped card using the Bubble Box Fri Dies. I simply folded my paper in half and then with the die just barely off the folded edge, ran it through my Big Shot and... instant shaped card! Then I used the Bubble Box dies to create my background layers. Next I cut my cup using one of my very favorite cup dies from some Copic friendly paper, the Coffee Cup Fri Dies ... that wonderful heart handle! 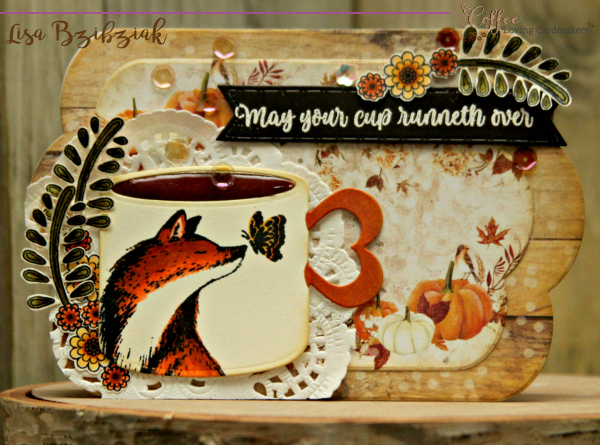 I stamped part of the beautiful fox from the Foxy stamp set onto the cup with Memento Ink and colored it in with my Copics. I added some liquid glass to the Coffee. 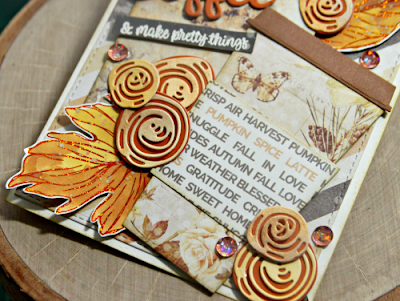 Then I stamped the beautiful flowers and foliage stamps from the Foxy set, colored and fussy cut them. And finally this perfect sentiment from the Peace, Love and Coffee stamp set on black. The banner was cut using a die from CDD. I normally don't attach anything right away so that I can move things around on my base until I'm happy with what I'm seeing and then using various thicknesses of foam tape and other adhesives to attach it all. I finished it off with some sequins from Paper Sweeties. 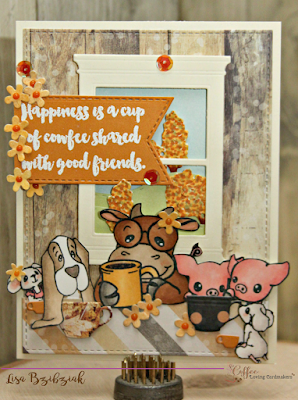 With this one, I'm playing along with a challenge over at Double Trouble which is to use Three Colors and a Stamped or Digital Image as well as Brown Sugar Challenge to use Creatures Great and Small! They're playing together for a couple days yet and you should check them out!! I cut the base rectangle striped layer with a die from Kat Scrappiness. Another one of my favorite cup dies is the To Go Cup Fri Die from CAS-ual Fridays! It's a fantastic size when you want a cup to be the Star of the Show and I cut it and the wrap out strategically from my papers so just what I wanted would show. You may see I used the Bubble Box Die again to tuck a layer underneath the cup where I'd place my sentiment. Then I cut a few of the pretty flowers from the Garden Fri Dies... the swirly top layer was cut from some previously watercolored paper and Goldrush cardstock for the bottom part of the flower. I had some of the pretty leaves that I printed, foiled and watercolored from Graciellie Designs left over on my table and they were just right to tuck in and around my card pieces along with the beautiful flowers. And then I built my sentiment using the Coffee word die from the Coffee Cup Fri Dies set and that cute sentiment from the Coffee Talk Stamp Set. Just a few sequins sprinkled around and it was done! You really do need to check out the huge selection of Coffee and Tea items in the CAS-ual Fridays shop! I'm playing along with this one with the Outlawz Twisted Thursday Challenge with a Twist of Anything Goes this week and the Simon Says Stamp Wednesday Challenge which is Anything Goes also! Kat Scrappiness Double Stitched Rectangles; Our Daily Bread Designs Layered Lacey Ovals, Cups & Mugs Dies, Violet Single Stamp, and leaves from the Pretty Posies Dies; Sentiment from Lil' Inker Designs Coffee Talk 2 Stamps and some beautiful leftover autumn leaves that I had cut and watercolored from an SVG file over at the Cutting Cafe. I've also used the Kat Scrappiness Double Stitched Rectangles, a window from Memory Box, and those awesome trees from the Craftin Desert Divas Fall Border Dies. Also, for the cups I used the Mini Cups and Mugs dies from ODBD and that teeny Tiny Cup from Memory Box. I'll be linking this one up to Double Trouble and Brown Sugar as well through Instagram... and hey Tracey! There's even a Punny Sentiment for you! And now... the Blog Candy! I have for you one Moo Brew stamp set that I will send to one commentor from this post! That's your second chance to win something here! So cute, right?? And love the punny sentiments and that awesome Coffee Shop sign! I sure am going to miss Little Acres... I was so lucky to get to know Chelle and Miko when I stumbled upon that Coffee House Mouse set on Facebook... because that's what it's about right... the relationships we create while we're doing this crazy thing! So leave me some love and have a chance to win this set. I'll use the same schedule as Amy for commenting and announcing the winner and if you want me to contact you please be sure to leave me your email address! EDITED TO ADD: The winner of the Moo Brew stamp set here on my blog is Lucy Evans! Congrats to Lucy and thanks so much to everyone for stopping by and leaving love! All of the winners from the CLC prizes have been announced on the CLC blog as well as a document in the Coffee Loving Papercrafter's Facebook Group. Congrats to all! Whew!! Honestly.. it was hard to stop.... all of our CLC sponsors have so many cool and beautiful products, coffee related and not. 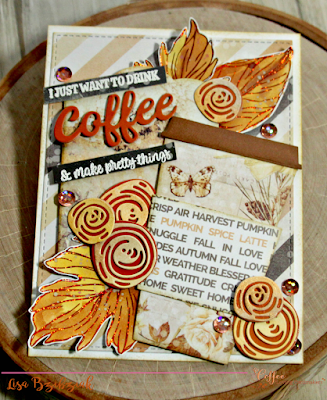 When I shop, I usually start at the Coffee Loving Cardmakers Blog from one of the hops and click from there...lol! Thank you so much for stopping by today and sticking with me through to the end! 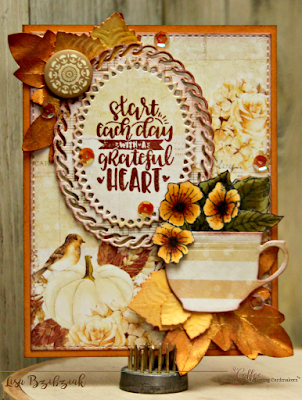 For chances to win all of the prizes offered, be sure to comment at the Coffee Loving Cardmaker's Blog, Sheri's Blog from Gina K Designs, all of the CLC DT stops AND the sponsor stops! There are prizes everywhere!! Your next stop along the way is the oh so talented Rubeena Ianigro ... Yes! The illustrious Ruby is on the Brew Crew and forever a part of the heart of the Coffee Loving Cardmakers! So head on over there and enjoy! And again... a special thanks to Michele at CAS-ual Fridays for sponsoring my post! And don't forget CAS-ual Fridays has a challenge that starts every other Friday. This time around it's a sketch challenge and you should check it out here! And a Calling All Sistahs Encouragement Challenge and this time around it's Black & White... check that out here! Be sure to visit all of the Design Team Blogs and the Sponsor Blogs! I love your fall coffee cards. Your barnyard coffee card is awesome! I love that cow and pig and dog drinking their coffee! WOWZA. Check out all that fabulous inspiration Lisa! All of your cards are WONDERFUL. Moo Brew, cracks me up. Wow wow wow!! These are all FABULOUS! LOVING the fox on the first one and love love love that scene you created on the last one!!!!! I love the warmth of your cards. The soft coffee shades and little flowers are beautiful touches, and your projects are just loaded with creativity. Such a fun visit! Your cards are awesome. I love Your Cup Runeth Over and that heart handle on the cup. Gorgeous cards, Lisa! You always add such wonderful elements and fab rich colors!! Love the detail in your cards! Wow great cards - such pretty color combos and amazing layers!!! Wow!! What a great line-up of coffee cards! I would be hard pressed to pick a favorite from these beautiful creations! Wow, love all your cards, especially the sentiment on the 3rd card. WONDERFUL cards, I especially love the red fox card, great colors layering and design! Oh my gosh - how have I not seen your work! I adore your collage type cards. Oh my goodness... all of your cards are just wonderful... I love all the layering and textures. I'm going to hop over and check out that shop you linked also! Adorable critters on that last card! Wow Lisa-I don’t even know where to start! The layers that you put together are just gorgeous and balanced. There are so many details, but they all work together for such lovely cards! Great use of the various Super Sponsors products! Such a fantastic post filled with creativity. I love your foxy coffee cup...once again you've wowed me!!! Oh to be as talented as Lisa! Thanks for sharing with the Double Trouble Papercrafting Challenge. Won't you stop by the Color My Heart Dare and join "TEAM TRACEY"? WOW!! Love the all!! All of the colors and layers are brilliant and the fox is perfect! Oh, I love the colors you have used on these cards! And I love the little fox! Happy coffee day! Oh my! These are so beautiful. Your first card is so unique and the dimension and layers are awesome. I love the color palette you chose and all the details on each card. Thanks for a chance at some blog candy too! What a good axcuse for all the coffee and the beautiful cards. You had so much fun makng them and it is hard to pick a favorite. Wow what an incredible job! I can't believe how many cards you made and each one so detailed and beautiful! Wow! Your on a roll all your cards are fantastic and I love the colors I love everything about them all the layering great job!! Wowzers, you have been busy. I love all the cards you created. You do such an amazing job with layers. Wow oh Wow - you have done some awesome creations here!! I want them all Lisa! Thanks for all your hard work and for this fabulous hop as well - Wishing you a great creating week! [utb01@att.net] - sending cyber hugs and lots of COFFEE wishes too! ~ Gail~ I am enjoying this hop! Wow Gorgeous cards! Happy National Coffee Day! WOW ! So many inspiration in all these projects ! I'm sure you had to drink a lot of coffee to make all these beautiful cards ! Thanks for sharing and for inspiring. Liza you did it gain, what a bunch of wonderfull cards you made for this Nat. 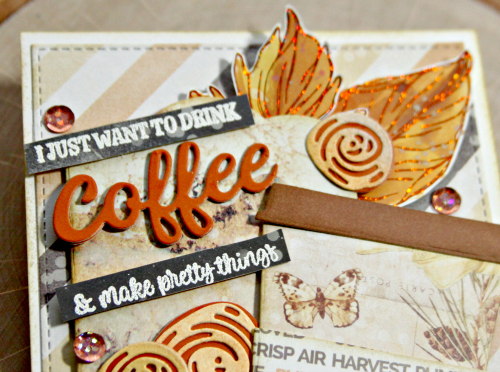 Coffee Day and da blog hop. I toooo like them all. I Love how your first card says "May your cup runneth over." Love it! Love all your projects today! That fox card is amazing! Wow! Those cards are incredible!Just so many layers, so pretty :) Thanks for the wonderful inspiration and the giveaways! Love the vibe...smooth and creamy! Beautiful job and so creative! Love all the unique features of your cards and the beautiful fall colors! They are all amazing. Oh my Lisa, all three of your beautifully crafted cards speak to me. I love the colours and designs and all the elements whether they're dies or stamped images and sentiments, they are fabulous. What an awesome celebration of National Coffee Day you've created. Thanks so much for inspiring and sharing! Now I'm going to enjoy my cuppa joe! OVER THE TOP swoony cards!!! I want to hit all the hop spots...might take awhile! Beautiful cards! I love the fox on the cup! So fun and adorable. Beautiful job. All cards are fabulous, and I really love the coffee in the fox mug. Clever! Wow, loving all your cards and write-ups. Had to scroll down so many pages to get to a comment...I should have started earlier. Your cards and inspiration are always so detailed and so much enjoyment to look at...and then to go back and take a second look because you're afraid you missed something. You know I can't say enough about your beautiful cards. Thanks so much for including Double Trouble in the mix and hope to see one of your other cards in the challenge too. Very unique cards. Love the fall colors. Fabulous cards! Love that first one with the fox! Beautiful fall colors and gorgeous details! Had to go back and take a closer look at all your cards, they are all so pretty! Wow, such wonderful cards! I think the first one is my favourite - I just love the fox. Wow your cards are amazing all that layering and coloring. These are just amazing cards! Love the colors and designs! Wonderful cards, Lisa! I especially love the autumnal theme on each of them. Such a fun hop! Thank you for sharing all your pretty work! Happy National Coffee Day!!!!! Lisa love the fabulous fall cards. The one with the little fox is my favorite.He is just so cute. Happy Coffee day. I love the way you mixed critters and coffee!! The fox card is my favorite but they are all just beautiful. Thanks for the inspiration and chance to win! Such pretty cards! The little barn critters are so much fun especially drinking coffee. How adorable is that cup with a fox. So many great projects. Wow. WOW LISA! I love it ALL! Thank you for the DOUBLE chance to win! I love the fox one the most! The vintage look of all your cards is so unique! Your cards are beautiful and fun! I love this paper as well, and you have sparked some inspiration for me. Really cute stamps and dies - my favorite! Your cards are amazing! I just love all of your cute little critters! I think your Fox and butterfly on the coffee mug is just so precious! I also love all the layering and beautiful patterns that you have used for your beautiful cards too! 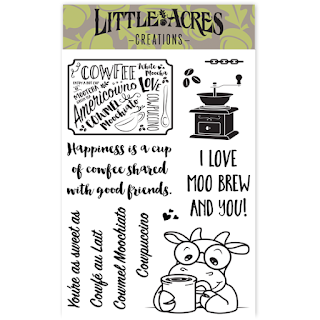 I really love That Moo Brew stamp set it is so adorable! Amazing cards. I think I've drooled over your fox card several times on Instagram today. It's my favorite and I'd love a mug that looks like that!! All of your cards are amazing, Lisa! I love seeing a sweet fox in the fall! Great color and vibrant design! Happy fall! Wow! Wow! Wow! Your cards are jaw-dropping gorgeous!! Love!! Oh goodness do I love these little set of fall coffee cards. It is cool outside here and windy here, between the weather here and these beautiful cards I want to snuggle with a cup of coffee and a stamp magazine. such a bunch of caffeinated wonderful! 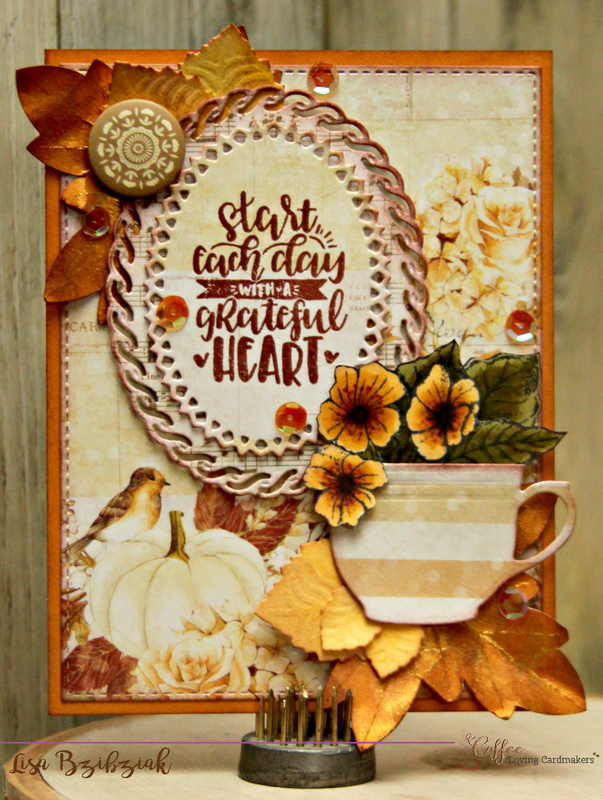 luv the mug you created on your first card! WOW! Love all your cards! Thank you so much for letting me join the fun this week! your cards are all so fun! Super coffee themed cards, Lisa! Very cute cards! I love the layering you did on all the cards, and the colors you used. Textural sophistication and a love of color are evident in your lovely designs. There’s always that little something extra. I’m inspired! Wow so many ideas. Beautiful cards! Wow, you’ve been busy! That fox though... amazing. Love all the fall colors! Beautiful cards, love all the elements! Love the cow drinking coffee! That's a great set. Simply gorgeous cards in perfect colors! Just amazing cards. Thanks for the inspiration!!! Loads of gorgeous creations, thanks for all the fab inspiration, and all the useful info! Your skill is amazing. The details on each card are incredible! Both of these cards are wonderful. Love that fox! Wow, your cards are gorgeous. So many beautiful layers give such interest and dimension. Love them all! All your cards are so amazingly well designed and I love your style! Beautiful cards and adorable stamp set! Lisa, love your fall colors!! These are gorgeous papers and I love the layers. The fox on your first card is too cute!! Wow...love it...specially the cup die and the lovely fox!!! Beautiful cards! The one you made for the current CAS-ual Friday sketch challenge is stunning! Wow your cards are so detailed and pretty. Your cards are so fantastic! I really like the papers you used in your cards and I am sure it was not hard to use the pack, but hard to decide which great paper went with another great paper. Thank you for your inspiration! What does the fox say? He says "I love coffee and I love your card". That's what! How sweet. Lisa, both of your cards are super adorable! I have always loved everything you make and these just made me HAPPY! Thanks for sharing your talent with us once again! So far on this hop, I've come across three things that I absolutely MUST HAVE, and this CAS-ual Fridays set is one of them. The whole "cup runneth over" thing.....I'm sure you understand. I think one of the best parts about these hops is being able to see what's new everywhere and being inspired to buy new things from these generous companies that support the hops. It's such a treat, and your art is always SO very inspiring to me, Lisa. Hugs to you from Las Vegas. Wow, amazing cards! Such lovely designs and beautiful rich color combinations. Beautiful card, unique and awesome! Hi Lisa, I'm a first time visitor to your blog (I'm joining in the blog hop). I love each of your cards. Lovely designs, and I really love the autumn colours. Somehow coffee and autumn colours just go hand in hand. Wow! Gorgeous cards! Beautiful layouts and colors!!! Yay, Lisa... gorgeous cards and so fun! The sentiments are great and I love very much those Prima papers (mostly every :))! 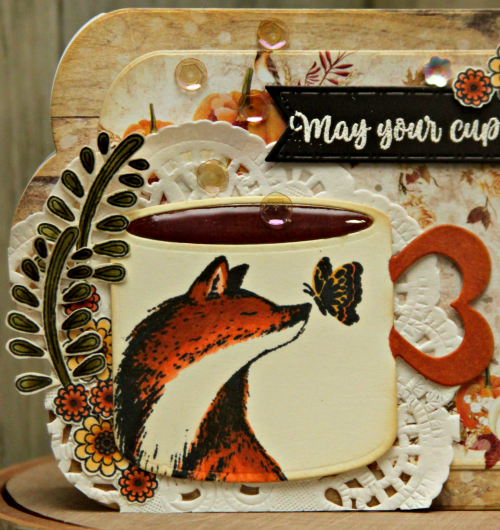 Absolutely in love with that foxy coffee cup on your first card. It is so beautiful! Oh my, my my, Lisa!! Your cards and foiling are over the top!! I love all your details! But, all your cards are my favorite!! You put so much thought and time into your craft that goes beyond cardmaking!! I, for one, appreciate it! Amazing hop cards!! TFS and inspiring, and encouraging me to be a better crafter!! All the beautiful coffee projects! Love the rich fall colors and textures on your cards! Both of them are stunning. Happy Coffee Day!!! Gorgeous cards, love all the details and colors. Such lovely creations! Love that sweet fox mug! So wonderful these are, the papers and dies you used with the stamps are awesome. Nicely done, and fun blog hop! Seriously! All these wonderful coffee Cards!! Fabulous!! WOW! Breath-taken-away by your array of coffee-themed cards that are works of art! Such beautiful arrangements; such eye-catching details; such stunning designs! If one of these landed in my mailbox, it would be framed immediately and prominently displayed in my craftroom. I can tell you thoroughly enjoyed creating these gems; they're infused with joy! What a fun and cute card. Love it. thanks for sharing with us. Lisa.... they all are AMAZING cards!!! Aw, I hate to hear that Little Acres is closing shop. Two awesome cards, lady! They're moo-tiful! WOW!!! What a fabulous set of coffee cards..love each one of them.. I like your Fall themed coffee cards. These are all fabulous Lisa! Wish that drink coffee and make pretty things card was in my office so I could stare at it every day, I love it sooooo much! Awesome cards, Lisa! Especially that wonderful fox on the first card! Love all the layering & beautiful fall colors you've used.